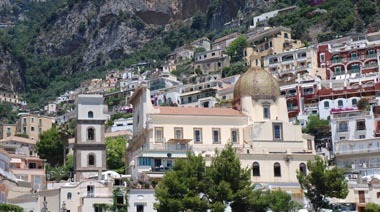 Positano really offers so many things to see and do, find some ideas on this page. From the Spiaggia Grande down Positano take the little road along the sea near the pier of Positano, after 5/10 minute walk you reach the beach of Fornillo, less crowded and full of typical restaurants. 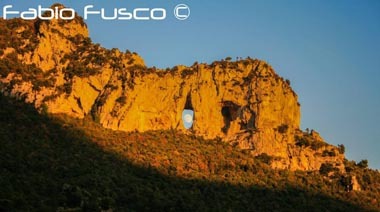 Clearly visible from the Positano Beach, is located precisely at the center of the country. It’s famous for its Black Madonna of Byzantine era; According to local mythology, the icon was stolen from Byzantium, carried by Saracen pirates who were overwhelmed by a terrible storm, they heard from afar a voice saying: “Posa, pose!” so they moored to the nearest village that just took the name of Positano in memory of the heard voice. The church was builded in 1200 to honor the Byzantine icon, you can admire the mosaic floor of the original structure in the apse of the church..
From the beach you can admire the beautiful dome of local tiles. Just behind the Church of Santa Maria Assunta it was found the medieval crypt in recent years that has returned some of the eleventh century sculpted capitals. 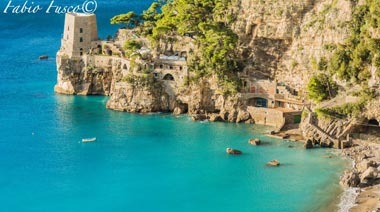 It is the main beach of Positano, ideal for relaxing in the sun or to taste the typical food of the place because there are many restaurants and bars. In summer it is at the center of the events organized by the municipality of Positano. For nature lovers it is a must-visit spot! It start from Nocelle up to Bomerano (Agerola). The whole walk takes about four hours, opening magnificent scenery with unique views of the Amalfi Coast. 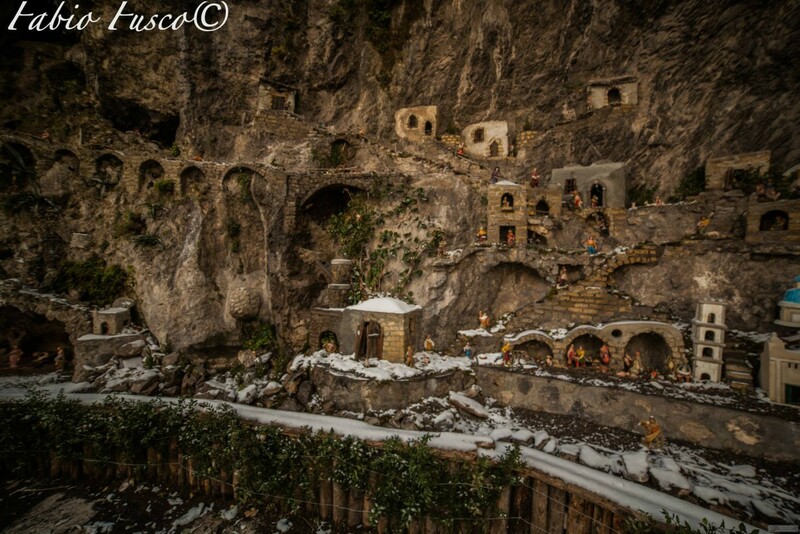 This is a picturesque dioramas located along the main road to the center of Positano. It is in the middle of Via Pasitea just next to Hotel Conca D’Oro. 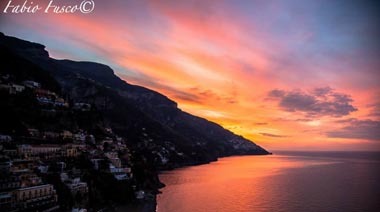 Frazione di Positano che negli ultimi anni ha saputo offrire una valida alternativa a Positano, oltre ai tanti ristoranti tutti di ottimo livello e alle tante sistemazioni offerte è sicuramente da fare una passeggiata alla visita della montagna con il buco che da il nome alla stessa frazione. 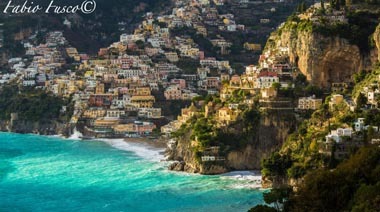 Village of Positano which in recent years has been able to offer a valid alternative to Positano, in addition to the many excellent restaurants and many accommodation, a musto do is to take a stroll to visit the mountain with the hole that gives its name to the same village. Positano village that looks more like to a small crib then a country. The road that connects the village was only completed in the late ’90s, locals have managed to preserve the charm of the place keeping it all like a small jewel. From Nocelle start the famous Path of the Gods, which is considered one of the most beautiful nature walks in Italy. Colorful and characteristic, offer tourists the opportunity to take a walk, buy a local souvenirs, take a drink or dine by candlelight. At Spiaggia Grande you can hire a typical boat or a rubber boat to spend a day in the clear sea of Positano and admire the view from the sea.